Below you fill find all funeral homes and cemeteries in or near Byron Center. Suburbs of Byron Center: Byron Township. Byron Center is also known as: Kent County / Byron Center CDP. Zip codes in the city: 49315. Some of the notable people born here have been: R. Brandon Johnson (actor and presenter). Byron Center is an unincorporated community in Kent County in the U.S. state of Michigan It is a census-designated place (CDP) used for statistical purposes. 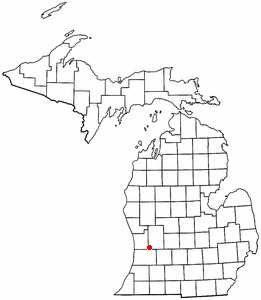 The population was 5,822 at the 2000 census.The community is at the center of Byron Township, about 14 miles (23 km) south-southwest of Grand Rapids. The Byron Center ZIP code is 49315, although the area served by the ZIP code also includes most of Byron Township as well as portions of Gaines Township to the east in Kent County, and Jamestown Township to the west in Ottawa County and portions of Salem Township to the southwest and Dorr Township to the south in Allegan County. It was written by Kalamazoo Gazette on December 11th, 2018 that Helen Joyce Sabin (Welch) died in Byron Center, Michigan. Ms. Sabin was 83 years old. Send flowers to express your sympathy and honor Helen Joyce's life. It was written by Kalamazoo Gazette on May 30th, 2018 that Joyce E Geiger (Curtis) perished in Byron Center, Michigan. Ms. Geiger was 84 years old. Send flowers to express your sorrow and honor Joyce E's life. It was reported by Ann Arbor News on February 4th, 2018 that Jean Marie miss "Jeannie" "A J" Campbell died in Byron Center, Michigan. Campbell was 67 years old. Send flowers to express your sympathy and honor Jean Marie miss "Jeannie" "A J"'s life. It was disclosed by Kalamazoo Gazette on November 3rd, 2015 that Brent Larson died in Byron Center, Michigan. Larson was 58 years old. Send flowers to express your sympathy and honor Brent's life. It was revealed by Lynden Tribune on April 8th, 2015 that Janet Stremler (Lynema) perished in Belingham, Washington. Ms. Stremler was 70 years old and was born in Byron Center, MI. Send flowers to express your sympathy and honor Janet's life. It was reported by Bellingham Herald on March 29th, 2015 that Janet Stremler (Lunema) passed on in Bellingham, Washington. Ms. Stremler was 70 years old and was born in Byron Center, MI. Send flowers to share your condolences and honor Janet's life. It was disclosed by Kalamazoo Gazette on March 22nd, 2015 that Alan C Bussema passed on in Byron Center, Michigan. Bussema was 62 years old. Send flowers to express your sorrow and honor Alan C's life. It was revealed by Kalamazoo Gazette on December 12th, 2014 that Waren Paul Freestone perished in Byron Center, Michigan. Freestone was 93 years old. Send flowers to express your sympathy and honor Waren Paul's life. It was reported by Kalamazoo Gazette on December 3rd, 2014 that Opal E Burnside (Johnson) passed on in Byron Center, Michigan. Ms. Burnside was 90 years old and was born in Knoxville, TN. Send flowers to express your sympathy and honor Opal E's life. It was reported by Flint Journal on March 28th, 2014 that Beverly B Stickney (Hart) passed on in Byron Center, Michigan. Ms. Stickney was 84 years old. Send flowers to express your sorrow and honor Beverly B's life. Byron Center is an unincorporated community in Kent County, Michigan County in the US state of Michigan It is a census-designated place (CDP) used for statistical purposes. The population was 3,777 at the 2000 United States Census census. . . .
New Lothrop wrapped up an outright Genesee Area Conference Blue Division championship Friday night while defeating Byron 43-7. The 2010 Hornets also ... Henry Birchmeier at left guard, Leo Harris at center and Nick Severn at left tackle. Cook Funeral Home services the greater Byron Center, Byron Township, Cutlerville and Dorr area. Cook, Fred - Cook Funeral & Cremation Service, Byron Center, MI : Reviews and maps - Yahoo! Local, 616.534.7619. Get Ratings, Reviews, Photos and more on Yahoo! Local. We work with local florists and flower shops to offer same day delivery. You will find budget sympathy flowers in Byron Center here. Our funeral flowers are cheap in price but not in value.